Here’s what can be derived based on download rates and installed base of devices. Please note that I am assuming that the number of devices put out of use is negligible. In defense of this, I would argue that the vast majority of iOS devices sold are still serviceable and are re-sold. However, the estimate should be rounded down. The data shows that there’s been a slight trend upward in download rate/user but it’s been fairly steady. The implications are interesting: if you know the number of iOS devices in use, you can determine the app economy turnover with reasonable accuracy. If you also know app ASP, you know sales, and even margin. Conversely, if you know the app download rate you can derive the device installed base. So in September I looked forward to an iOS user base of 500 million. It could be reached by 2013. 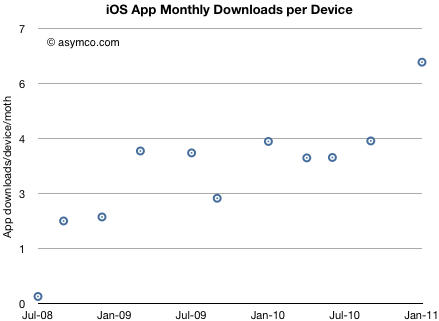 Assuming each user downloads 5 apps per month that would mean 2.5 billion downloads per month.